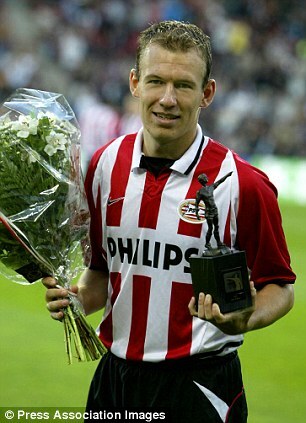 Nickname: "Boyke" , "Mr. Wembley"
Robben first came to prominence with Groningen, for whom he was player of the year for the 2000–01 Eredivisie season. Two years later he signed for PSV, where he became the Netherlands' Young Player of the Year and won an Eredivisie title. The following season Robben's signature was pursued by leading English clubs, and after protracted transfer negotiations he joined Chelsea in the 2004 close season. Robben's Chelsea debut was delayed through injury, but upon returning to fitness he helped Chelsea to consecutive Premier League titles, and was the FA Premier League Player of the Month in November 2005. After a third season in England which was punctuated by injury, Robben moved to Spanish club Real Madrid for €35 million. In August 2009, Robben transferred to Bayern Munich for a fee of around €25 million, scoring two goals on his debut. 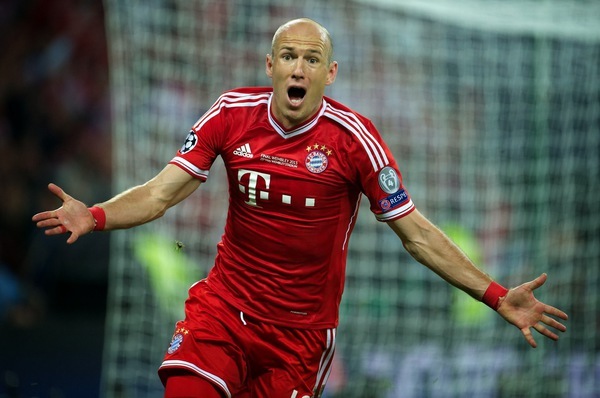 In his first season in Munich, Bayern won the league title, Robben's fifth league title in eight years, and got to the Champions League final. After his first season with the Bavarian club, the player was also named Footballer of the Year in Germany. Robben scored the winning goal in the 2013 UEFA Champions League Final. Last edited by El Capo on Tue Feb 07, 2017 12:23 am, edited 4 times in total. Well I guess you didn't watch many Bayern matches if you say so.. In all the games of 2012 until 2014, it were always Robben and Martinez who fought until the end, even when Bayern was destroyed by RM in the CL semi final, Arjen ran and didn't stop going forward..
Also 82 is ridicoulus when I see that guys like David Silva have 83 or Iniesta who has 84 for MEN on this forum..
Btw, today he showed his speed again when scoring the first goal, he's simply awesome atm and with no doubt the best right winger now.. I'm with you in that, Robben has a great MENT, even I consider 86 or 87, he always fight for the match until the end. I'd rather had his speed stats in 2012-2014 rolled back to previous stats. I don't think he always run this fast aside from few occasions. Also, the growth type need to be standard/lasting for all sets. Lol, how many Bayern matches did you watch? Robben definitely deserves these speed stats, he shown it in various matches for Bayern and the Dutch NT in the last years..
And one point from me: basing stats on what you think the player does is surely the wrong way when there are visual proofs that show how fast the player is..
Last edited by El Capo on Sun Oct 26, 2014 3:19 pm, edited 1 time in total. As far as I recall he didn't shoot a lot from outside the box (Long Ranger) and he only had 1 real injury so I'd rather give him injury tolerance B. I can be mistaken though.